Homer Dodge Martin was born in 1836 in Albany, New York. At a young age he fell under the patronage of Albany sculptor Erastus Dow Palmer and, in all probabliliy, associated himself with those artists in Palmer’s circle, particularly George Boughton, Launt Thompson, Edward Gay, and James McDougal Hart. Martin found his major inspiration, however, in the Adirondack and Berkshire landscapes near his home. In the winter of 1862-63, he moved to New York City, where he worked for a time in the studio of James Smillie before opening his own studio in the Tenth Street Building. Among other artists working in the Tenth Street Building at the time were Sanford R. Gifford, John George Brown, Jervis McEntee, and Eastman Johnson. Martin made his first trip abroad in 1876. He visited England on the trip, where he met James McNeill Whistler, and the two artists became close friends. 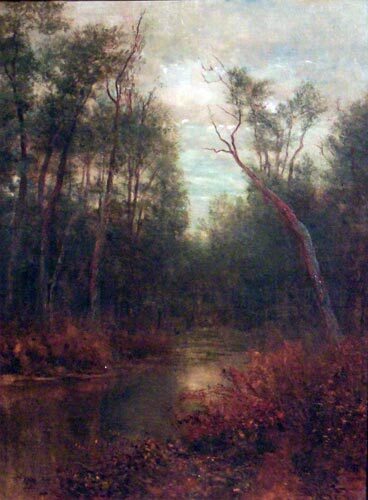 Martin was also an admirer of Corot and the Barbizon painters, and he became well known in America for the “poetic” quality of his landscape paintings. He painted many quiet, interior landscapes, such as the one depicted here, and may, in this respect, be thought a follower of J. F. Kensett and Asher Durand in their more intimate moods. His health failing, Martin moved to St. Paul, Minnesota in 1893 and died in February, 1897. Homer Dodge Martin was elected to the National Academy in 1874 and was one of the founding members of the Society of American Artists in 1877. His work is in the collections of the National Gallery of Art, the Metropolitan Museum of Art, the Brooklyn Museum, the Wadsworth Atheneum, and the Art Institute of Chicage, among many others.